When are awnings more than just awnings? The obvious answer is when you purchase your awnings from Paul Construction and Awning Company, where you are assured of finding not only the area’s finest awnings, but also Philadelphia PA’s best retractable awning prices, a winning combination to be sure. Paul Construction and Awning Company has been a leader in designing and building many of the showcase outdoor spaces in the vast Philadelphia cityscape and in its many suburbs. The company’s creative design staff has built a reputation of excellence by meeting the demands and challenge that occur in the many well-preserved historical sites and neighborhoods found within the city and in its many early American structures. Paul Construction and Awning crews have the imagination and experience to add usable space to homes that tie in beautifully with the overall structure without disturbing the aesthetic value of a home. In fact, with the range of products from the nation’s top awning producers, the overall effect of finished project can substantially increase a home’s curbside appeal and add value to a home. Credit Paul Salassa,the owner and operator of Paul Construction and Awning for assembling a talented group of skilled designers and woodworkers over 20 years ago. Paul saw a need for his services and ideas as Americans began to demonstrate their love of nature and began enjoying their outside environment. It became evident that many homes had significant outdoor spaces that for the most part were not being used, and in fact, were practically useless during the hottest, sunniest months of the year. Instead of basking in the sun and enjoying the experience, they preferred to stay indoors, in the coolness of their air conditioned homes to escape the heat. Many of the people who had, or were planning elaborate decks and patios, abandoned those hotspots, trading them for the cooler indoors during the hottest part of the day when the sun was at its peak. Paul saw the problem, then seized the opportunity. It was a shame to waste all that outdoor space when there was a solution close at hand. That solution was and is functional and aesthetically pleasing retractable awnings. 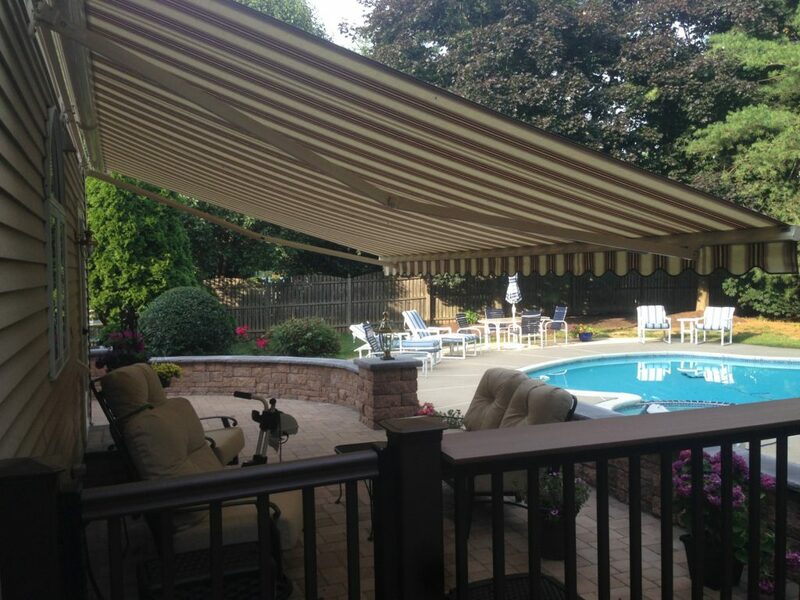 Coupled along with Philadelphia PA’s best retractable awning prices, homeowners could enjoy pleasantly, refreshing shady outdoor spaces, during full sun periods, a full 20 degrees or so cooler than before. Families and guests now had the option to control their environment as well as their comfort. With advanced technology behind their efforts, prime awning manufacturers like the Sunesta Awning Company could easily change outdoor spaces from unusable to invitingly usable or from full sun to full shade with the push of button or with a manual crank. This was not only an affordable way to increase outdoor living space, it was a great way to enjoy more time in the open air. Homeowners soon discovered there were even more benefits to retractable awnings. Awnings can limit the amount of direct sun that enters a home. By eliminating the sun, home interiors became cooler and the furniture upholstery and wood floors, Cabinets, drapes and accessories do not fade. Homes with central air conditioning systems saw their electric bills drop because of lower demand for cool air. Parents were pleased to learn that the retractable awnings shielded eyes and skin from the harmful UV rays. Paul Construction has always maintained a reputation for high quality and superior workmanship. In fact, Paul offers a lifetime warranty on any labor. That’s why it was important to select an awning company that lived up to Paul’s exacting standards. That company was Sunesta Awnings. The Sunesta awning is one of our most popular. It has the largest extension, which allows it to extend 14 feet , perfect sun shield for larger patios or decks The Sunesta is available in a large range of colorful patterns that will compliment the architectural features of any home. A 15 year warranty is standard for this dramatic awning . Motorized controls are available. Perfect for a medium size outdoor space. Sunstyle retractable awnings extend to a full 11.5 ft, perfect for medium-sized decks and patios. A 12-year warranty is included. Sunstyle retractable awnings are often used on narrow areas where a large projection is required. Perfect for Smaller patios and decks with widths of 10 feet or less are required.. The Sunlight retractable awning is the smallest of the three and comes with a 10-year warranty. Depending on your design and layout, either of these awnings or combination can transform an open space into an outdoor room where you can control your environment and comfort, You can enjoy complete flexibility with the push of a button to open or retract the awning in a matter of seconds. Create an instant room at a fraction of what a permanent structure would cost. Take advantage of Philadelphia PA’s best retractable awning prices at Paul Construction and awning. Retractable awnings play a big part in Paul’s overall success, but they represent only a part of the picture. The company is known throughout the state and in particular around the Philadelphia market for its expertise in a number of related areas. Each specific area of endeavor points to Paul’s focus on turning an average outdoor space into a fully functional, aesthetically pleasing legacy piece. Unlike most construction companies, Paul treats every job as a unique, custom project. He takes no cookie cutter approach, instead each project takes on its own special character. He incorporates the natural elements of every job site and creates a masterful version of form, function that will satisfy the needs and add enjoyment for every client, then capture those ideas in a hand-drawn drawing. Any rough carpenter can create a deck or outdoor space, but only a visionary can create a space that really works. Imagine the difference between a lumberjack and a cabinet maker or a house painter and an artist. Compare our design, and craftsmanship with any other organization as well as the ability to create functionality and you’ll find that Paul Construction Inc, stands out above the rest.Seeing is believing and hearing comments from satisfied clients tell a more-complete story. You owe it to yourself to fully investigate our claims. Paul invites you to dig into the customer comments and get an idea of what our customers have to say. For a stroll through some of Paul’s most creative projects, take a tour of the Portfolio link on the website. This is a rich depository of terrific ideas you might find useful in your project. Great ideas and great workmanship from Philadelphia’s most creative construction and building enterprises. Remember, a job worth doing is worth doing by Paul Construction. You are also invited to take a tour around our website. You can see first hand many of our recently completed projects. Take note of some of our exciting Sunesta Awnings installations that demonstrate the extent of our creativeness and imagination. We take awnings to new heights and an entirely new dimension. We can do it for you. For a prompt reply to any of your questions, complete the contact form on our website. Paul will follow up and answer any questions and help determine the cost of your project. Paul Construction and Awning Company is currently offering Philadelphia PA’s Best Retractable Awnings Prices to residents of the following cities and towns near Philadelphia.